The impact of internal dialogue is immeasurable and can take us into a deep abyss or help us climb a mountain. I’ve been on a journey over the last seven weeks. I was recently diagnosed with degenerative disc disease, something completely manageable and common. That seems pretty logical and easy to deal with saying it that way. But, truth be told, there were times when my internal dialogue led me down an unproductive path. Being a person who has been a runner since eighth grade, somebody who has learned to eat healthy due to IBS and someone who is constantly looking for ways to be my best self, it caught me off guard to learn that something was physically wrong with me–beyond the normal cold and flu we all get. I have always been a healthy person. Unfortunately, over the course of these last several weeks, I did not always effectively navigate through the on-going headaches, neck pain, nausea, dizziness and sore muscles. On the flip side, I’ve been doing a lot of reflecting, looking for the message in it all. Because I know without a shadow of a doubt, this is about more than my physical body. This is an opportunity to learn. 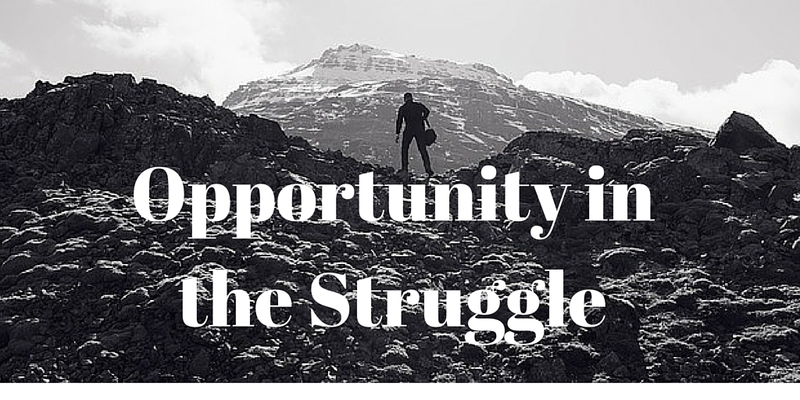 There is opportunity in the struggle. I wasn’t familiar with neurology, physical therapy, MRI’s, EEG’s, the structure of my spine, and all the other array of conversations I’ve had with my medical team over the last seven weeks. I am better because of this. I know more. My knowledge on the human body is deepened and despite the seven-week struggle (that still continues), I am convinced that I will be healthier as a result of this. This is the opportunity in the struggle. If one chooses to embrace the struggle, learning will follow and life will be better because of it. Instead of letting my internal dialogue being led with fear, I let it be led with a growth mindset. “This is pretty exciting to learn so much about the body that I didn’t know before.” (This is so accurate; I find an immense amount of motivation in learning). Wife. Mother. Learner. Coach. Becoming better today than I was yesterday and better tomorrow than I am today. Posted on November 30, 2015, in Uncategorized. Bookmark the permalink. Leave a comment.